Unlike the home or office where you have space and time to grind, perk, press or roast coffee beans, in the campsite you have to do with the bear minimum. You don’t expect to carry your heavy stove or brewer along, or the electric coffeemaker when you are off the grid. Nonetheless, you still desire to have the great tasting and aromatic coffee. Without this, you may lack energy, struggle to stay awake or may even feel grumpy all day or night. 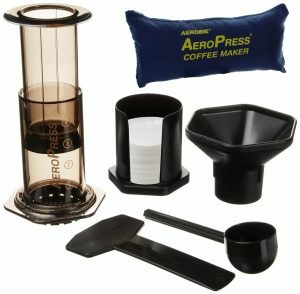 This is more reason for you to ensure you have the best coffee maker designed for camping and other outdoor activities. Knowing very well that finding the perfect product isn’t easy, we reviewed the top 10 best camping coffee makers in 2019 that should make life in the outdoors worthwhile. Brewing method : French press, Percolating, and Pour-over are the common methods used to make coffee. Whichever the option, it was important to look at the simplest and convenient. Pot Capacity : The number of users or your addiction to coffee influences the size of the coffee maker. A very small unit isn’t suitable for many users or a heavy drinker while a large one may be too bulky and wasteful for a single person or couples who take little coffee. Material : The outdoors are harsher than the indoors and it is critical to go for well-built and sturdy products. Stainless steel, glass, and heavy-duty plastic are some common material. Portability : It’s essential to choose a lightweight and compact accessory that is easy to handle, carry and also takes minimal storage space. Cleaning ease : The best product is easy to clean and doesn’t require too much disassembly. It’s also resistant to staining and won’t encourage coffee grinds, bacteria or dirt to hide inside. 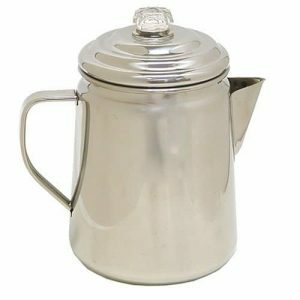 Enjoying a quality cup of coffee when camping or hiking is more certain with this silver-colored percolator by Coleman. Made from premium stainless steel, this unit measures 9.5 x 8.6 x 6.4 inches and weighs about 0.32 ounces. It’s loved for its decent size and capacity that will prepare up to 12 cups at once. It’s also light and portable and this makes carrying easy. You also will worry less about corrosion or rust thanks to the stainless steel body and quality glass lid. Nonetheless, the glass lid can break if dropped or handled badly. The GSI brand has become recognized for its high-quality coffee makers. This orange piece is among its top items and is made from a high-grade and hygienic material. The ultra light piece measures 4 x 2 x 6 inches and only weighs 0.02 pounds making it fit for camping, hiking, backpacking and other outdoor activities. It features sturdy legs for clipping on the mug and will easily fold up into a small size for better convenience and portability. Although very light and compact, it’s not very strong and can easily get damaged if used badly. 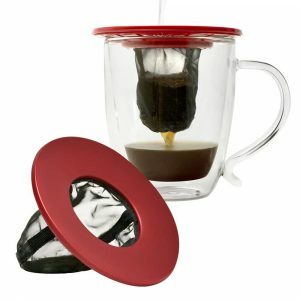 Great smelling and tasting coffee is within reach with this red Java drip coffee maker. The unit is made from high-grade and food safe silicone and measures 2 inches high and 2.0 inches wide. It, however, can easily expand more to accommodate more content and also increase the capacity. 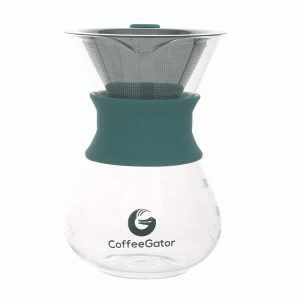 The 4-ounce and 4-filter capacity will make 1-12 cups and the fit-ring design offer tight fit and prevents spillage. Consumers are happy with its simplicity, compact natures, easy to clean, and good design. Some, however, are disappointed by the slight smell when new. Brewing a cup of coffee of whatever strength is what this red brew buddy does. The nylon-made unit is stronger and more hygienic than plastic and also lighter than stainless steel. It only weighs 1.6 ounces, measures 4.2 x 4.2 x 1.6 inches and should be easy to carry and store. The universal fit makes it suitable for most mugs and drinkers. The travel-friendly unit is pretty simple to use and is also eco-friendly. It’s also versatile, well made and saves space. The only downside is that cleaning isn’t very simple. 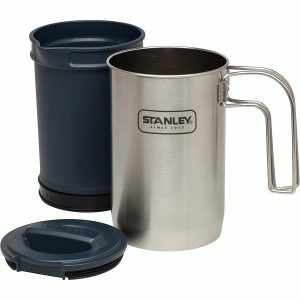 With a capacity of 32 ounces, this silver coffee maker is designed for camping, backpacking, hiking and other outdoor events. It’s made of sturdy 18/8 stainless steel and will resist rust, corrosion, fading, and discoloration. 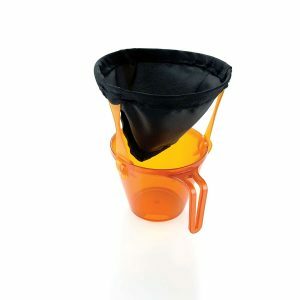 The lid consists of a melt-resistant nylon that produces fine coffee and lasts for a long time. This item measure 7.6 x 4.3 x 4.3 inches, weighs about 0.98 ounces and comes with an easy-fold handle for better packing and space saving. Consumers are attracted by the great tasting coffee it produces, easy to use and clean, and durability. It’s, however, a fairly large coffee maker. 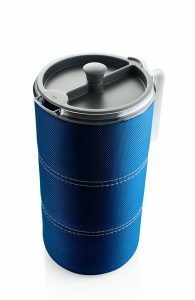 The blue French Press coffee brewer has a 50-ounce capacity and weighs about 1 ounce. It features a clear, lightweight carafe that is made of BPA-free plastic and is shatter-resistant. The handy unit comes with double-walls for better insulation and together with the insulated lid will conserve the heat and save energy. 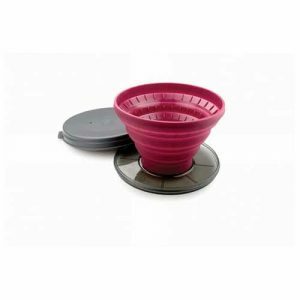 To prevent coffee ‘blow-by’ this stylish piece features a silicone ring plunger while the removable EVA sleeve makes cleaning easier. While the plastic gives it the lightweight and shatterproof nature, some users prefer the heavier glass material. 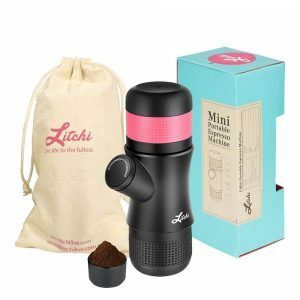 If you need to have a hot cup of espresso, this portable espresso maker is a perfect one for you. It has been ranked as the most lightweight and compact espresso Maker hence it is ideal for camping. It has a modern design and it is simple to operate. It usually comes with a carrying bag and additional filter basket for the machine. You just require adding coffee and hot water in it and pushing the pressure pump and you will have your coffee ready. It is made with high-quality plastic materials that are BPA free. It also comes with one year warranty. 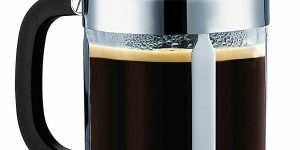 This black French press coffee maker consists of a large glass carafe and BPA-free plastic lid. 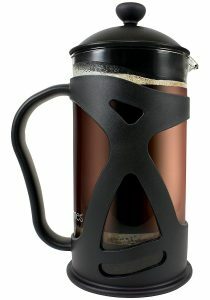 It has a 1-liter/ 34-ounce capacity and will make up to 8 cups of coffee. The unique and stylish outer shell has good insulation and will keep your drink hotter for longer. The dishwasher-safe unit comes with a solid and comfortable handle and an easy-to-use rubber plunger. You also won’t be bogged down by its size or weight since it measures 10 x 5.9 x 5.5 inches and weighs 14.1 ounces. Some of the reasons that make it worth buying include scratch -resistant glass, beautiful design, energy efficient, comfortable handle and easy to clean. On the downside, it’s a little heavy and also not the cheapest. In your next camping, backpacking, or hiking expedition, you should make an effort to take this green coffee maker along with you. Firstly, it well made from stainless steel and this assures you of durability. Secondly, its 10-ounce capacity will easily prepare up to 2 cups at once. Thirdly, its dimensions of 4 x 4 x 5.7 inches and weight of 0.56 lb make carrying convenient. Finally, it’s environmentally friendly, simple to use, and works great. Unfortunately, it can’t handle more than 2 cups at a time. This clear coffee maker allows you to see the contents courtesy of the clear glass construction. The 1-pound unit measures 5.1 x 5.1 x 11 inches and comes with 350 filters. The quality filter and design ensure the coffee not only tastes good, smells awesome but also is also extra fine. This is achieved by the gentle pressure and total immersion that get out every ounce of flavor, taste, and color from the coffee grinds. And for added convenience, it includes a Tote Bag. Some of its pros are great tasting coffee, solid design, and easy to clean. However, some users say the rubber plunger isn’t long-lasting. Preparing good coffee even when outdoors shouldn’t be a problem. You also don’t have to carry heavy or bulky units or use small items that require people waiting for their turn. You can find the appropriate item by ascertaining your needs at hand and then reading this review to find an accessory that matches your needs and preferences. We have summarized the best products that are already available in the market and will serve you well for a long time. Simply follow go through the top 10 best camping coffee makers in 2019 review again and make a good decision.